Some of our best aerial drone photos of the Austin Skyline. Our aerial drone photos of Austin Skyline and looking up Congress Ave toward the Texas State Capital. In this aerial drone photo over Austin you can see the Texas Capital along with many of the city high-rise buildings including the Frost, Austonian, W Hotel, Austin 360 CondosOne Congress Plaza, Radisson Hotel, Marriott, Four Season Hotel, along with the Ashton Condos, One Congress and a bit of Lady Bird Lake. Austin is the fourth largest city in Texas and the 11th most poupulous in the United States. It is also the fastest growing city in the US. The latest population numbers of the city is 947,890 as of 2016 census. The city was name after Stephen F. Austin the “Father of Texas”. The city has a diverse businesses in with a lot of high tech, government, university, blue collar workers along with musicians. Austin claims the term that it is the “Live Music Capital of the World”. The city is constantly growing especially downtown area as it has been a city of crane for almost ten years now. Another aerial drone photo of Austin Skyline looking down Lady Bird Lake at sunset. Austin Sunset Pano Cityscape – This is a aerial panorama of the Austin skyline sunset pano in downtown along LadyBird Lake as the sun was setting with this gorgeous sunset. In this image over Austin skyline you can see the city high-rises as they run along the waterfront along with the many bridges that span the lake, like the Congress bridge, all the way down to the Lamar Street Bridge . The many well known high-rise building or also in site such as Austin tallest building the Austonian, the 360 Condos, the W, the Marriott, Frost, Four Season, Hyatt and many more. You also see the congress bridge and fist street bridge as they cross Lady Bird Lake with this birds eye view of the city over Austin. We were able to capture this high quality aerial image because we use a full frame camera on our drone for out still photographs so we can get the best image which can be printed easlity as a 20 x 60 or larger size without loss of resolution. 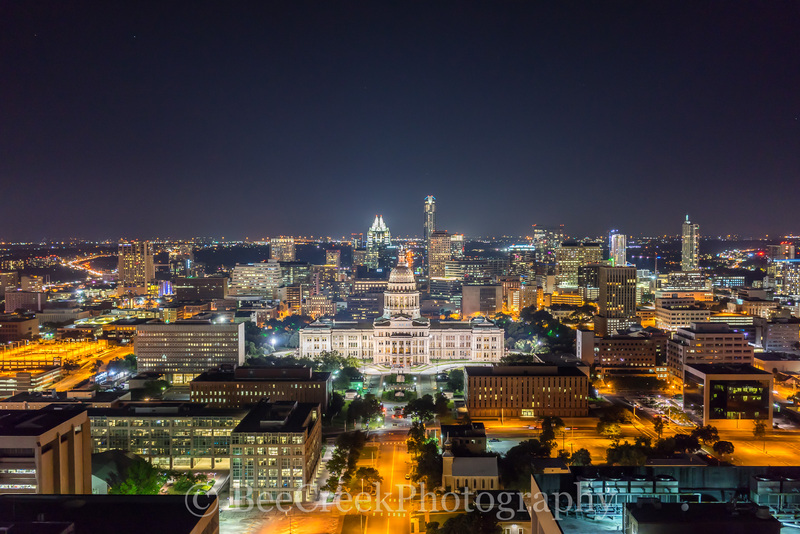 Austin Skyline Aerial Twilight – This is another aerial panorama of the latest over Austin skyline in downtown area at night. The skyline along Lady Bird Lake has been changing almost yearly and will continue to change as there are plans for many new high rises in this area over the next couple of years but for now this is the latest image of this wonderful modern city. From this angle you can see Lady Bird Lake, both Congress bridge and First Street Bridge along with all the unique architectural high rises like the Frost building and the Austonian plus the W hotel and the 360 Condos to name a few. We were able to capture this high quality aerial image because we use a full frame camera on our drone for out still photographs so we can get the best images which can be printed easlity as a 20 x 60 or larger size without loss of resolution. Texas Capital Night Aerial- This is a aerial cityscape image of Austin Capital Night View of our state Capital which you don’t see to often from this view. This big views let you see all of the downtown area, you can see all the way down and up Congress Ave and see the citie’s high-rises skyscrapers like the Frost and the Austonian in the background. Austin Cityscape View Aerial Pano – We capture this aerial over Austin with Skyline along Lady Bird Lake with the downtown area including the Texas Capital and the UT Tower in this Panorama. The one day where we saw the sun come out in some time. This image capture the view down Lady Bird Lake with the Lamar bridge, all the way to Congress with the city along the shoreline.We were able to capture this high quality aerial image because we use a full frame camera on our drone for out still photographs so we can get the best image which can be printed easlity as a 20 x 60 or larger size without loss of resolution. Austin Aerial Skyline Panorama2 – This is an aerial pano image taken at of the city of Austin skyline taken from about 180 ft of downtown, You can see the many high-rise buildings in the cityscape like the Frost, Austonian, The W Hotel, along with the Hyatt with the Firsts street bridge and the Congress Ave. Bridge which are along Lady Bird Lake.. The Austin City Hall is in front of the W hotel along with many other new buildings like the Marriott and the Colorado building. 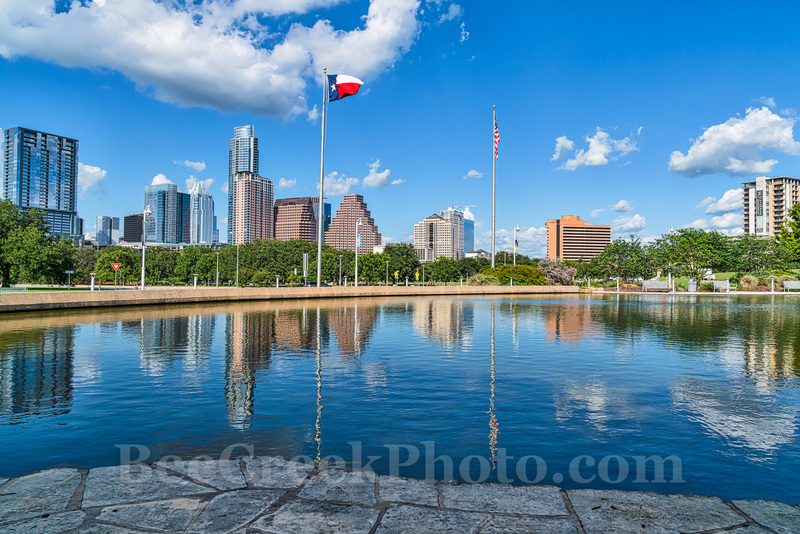 Posted in Best Of and tagged aerial, Auditorium shore, austin 360 bridge, Austin aerials, austin cityscape, Austin downtown, Austin skyline, best austin skyline, city, downtown, Lady Bird Lake, town lake on August 26, 2017 September 26, 2018 by Bee Creek Photo. Oasis Sunset Panorama – Another captured of the Oasis sunset panorama outside of Austin at the Oasis restaurant at Lake Travis. The restaurant is located in far west Austin at the foothills of the Texas Hill Country on Lake Travis. The Oasis restaurant likes to promote itself as the ‘Sunset Capital of Texas’ with it decks facing west for maximum sunset views. The restaurant sit on a bluff about 450 feet over the lake overlooking the big bowl at the lake. Lake Travis is part of the Highland lakes, after Mansfield dam was built in 1942 it became the largest reservoir for water storage creating the largest area of water where the Oasis overlook is. The Oasis restaurant is popular with locals and tourist and it not uncommon to find buses lined up in the parking lot. It has become a destination for people traveling in this area of the Hill Country to visit to capture a peak at the sunset. Most people who live in Austin will tell you The sunsets view from this location are great anytime of the year. The Oasis restaurant has been here for thirty years, but in 2005 a lightning fire destroyed parts of the structure but it was back in business about two weeks later over time the portion that had burn down was re-built and expanded for maximun sunset views. This Lake is one of the largest reservoir of water along the Highland lakes. We have taken many sunset images from the Oasis on Lake Travis and this is my favorite. Every scenic sunset image we have capture from here is unique and today was not the exception. The Oasis Restaurant sits on a bluff 450 feet over the lake has some of the best decks to view the sunsets around central Texas. Oasis restaurant has been here for thirty years over looking the big bowl at Lake Travis. In 2005 a lightning strike cause parts of the restaurant to catch on fire and almost burn down completely. Only parts of the restaurant were destroyed and it reopen a few weeks later but the older wooden part were eventually replaced with the newer buildings along with a parking garage. This newer parts including shops, cafes, and other restaurants many of which have great views also. In any case the Oasis is a great place to come and have a meal and margarita and watch the sunset on any day. Just another beautiful panorama sunset in the Texas hill country over looking Lake Travis. Lake Travis is loccated on the western edge of Austin at the foothills of the Texas Hill Country. Lake Travis is the largest reservoir along the highland lakes in Texas is a very popular spot for swimming, boating, fishing, scuba diving, and picnicking. Posted in Photo of the Day and tagged Austin, bowl, fire, hill country, Lake travis, Oasis, pano, panorama, restaurant, rural, scenery, scenic, sunset, sunsets, texas, Texas Hill Country, tourist, Travis on August 23, 2017 November 9, 2018 by Bee Creek Photo. There is something magical about the Austin skyline at night. In this image you see the high rise buildings as they reflected back into this pool of water after dark from the Palmer/Long Center in downtown Austin. The Austin Skyline has been constantly changing in the last few year but you can still see some of the iconic building like the Frost Bank building, the Austonian, the 360 Condos, W Hotel and many others from this area. People come at night just to enjoy the Austin skyline from this area to watch the skycrapers buildings light up and reflect back into the waters nearby. Austin is fastest growing city in the US and is the Capital of Texas which has a population over 947,000 and continues to grow, it is 11th most populous city in the US and the fourth largest city in Texas. Austin is located in central texas at the beginng of the Texas HIll Country. Austin has many waterways including Lady Bird Lake in downtown, Barton Springs, McKinney Falls, Lake Austin, Colorado River, Lake Travis and many more in the hill country. Austin is a diverse city made up high tech workers, government employees, college students along with blue collar workers. Austin has a vibrant music community with it many night clubs with live music and Austin City Limit music hall, along with the many music event held in the parks around the throughout the year. Austin claims the title of Live Music Capital of the World of it rich history of live music from the day of the Armadillo Headquarters, to South by Southwest along with the many places you can go and listen to live music throughout the city. Posted in Photo of the Day and tagged Austin, Austin skyline, buildings, cities, city, high rise buildings, live music, music, night, reflected, Reflection, skyline, texas capital, Texas Hill Country, urban on August 19, 2017 September 26, 2018 by Bee Creek Photo. Dallas State Fair with the Texas Star at the State Fair with a vintage look. This fair is an annual event held at the Fair Park in Dallas from the last weekend in September for 24 days. The Texas Star is one of it most popular and longest running rides. The fair run along the same time as the college football game which is traditionally between Texas and Oklahoma. 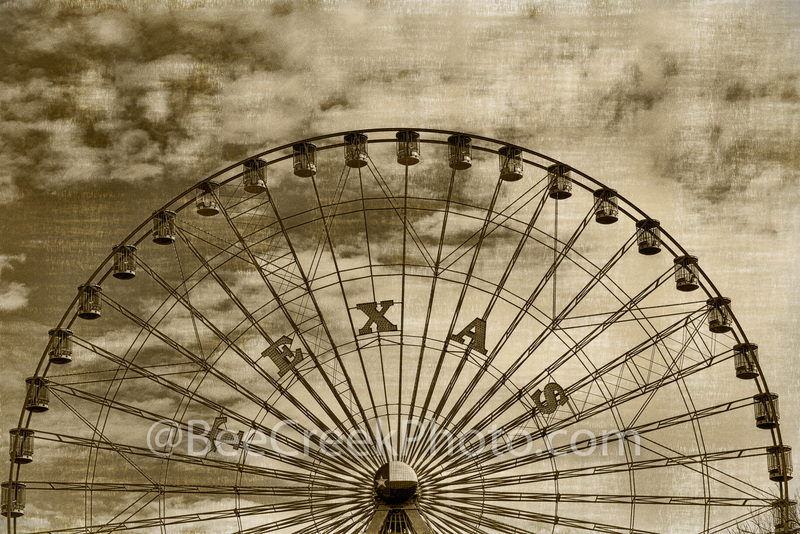 We love the Texas Star Ferris wheel with a vintage look in this image. This ferris wheel can be seen from a distance being that it is one of the largest in the US. We felt that we wanted to represent the long history since the late 1880’s with a vintage look much like what you would seen on a postcard at the early years of the fair with these two photographs. We also have none vintage image of the Texas Star. Dallas State Fair Vintage – Dallas State Fair of Texas with a vintage look. This fair is an annual event held in at the Fair Park in Dallas. The Dallas State Fair has been going on since the late 1880’s except during periods during World War I and World War II. This Dallas fair begins the last Friday in September and ends 24 days later. The State Fair of Texas is still consistently recognized as one of the most highly attended and best state fairs in America as well as Dallas’s signature event amusement park. The fair still has a full auto show along with children, puppet shows, Children’s Medical Center Barnyard, and Story Time. The Texas Skyway a gondola ride is also available which also only operates 24 days a year to transports visitors around the fairgrounds. The Texas state fair has also become famous for it fried foods, anything you can think of can be fried here and will. Besides the amusement park they have several museums, restaurants, beer gardens, shopping, music event on the grounds. However, they still have that oversize ferris wheel the Texas Star, that I loved as a child still one of the largest in the us. I felt I wanted to represent the long history with a vintage look much like what you would seen at the early years of the fair. Dallas Vintage Texas Star – Texas Star in Dallas with a vintage look . 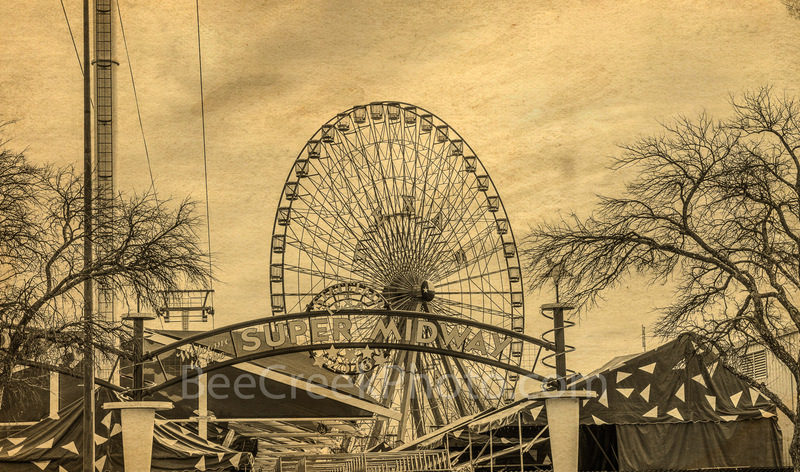 This image was taken at Fair Park in Dallas and the size of the ferris wheel is one of the top three in the US. We wanted to display it as it might of look on a post card back in the late 1800’s and early 1900’s when it first open. The Fair Park has expanded to include many more rides in the amusement park area along with museums, Swan Lake, and restaurants on the fair grounds. The fair begins the last weekend in September and runs for 24 more days as it coinsides with the Texas OU weekend and other Cotton bowl games. Posted in Photo of the Day and tagged aged, amusement park, Cotton Bowl, Dallas state fair, Dallas Texas Star, Fair Park, ferris wheel, football, rides, State Fair, texas, Texas O-U game, Texas Star, vintage, vintage photos on August 7, 2017 September 26, 2018 by Bee Creek Photo. The Houston Discovery Green Park was officially open to the public in 2008 in downtown area of the city. This 11.8 acres park is located across the street from the George Brown Convention Center with a parking garage underneath the park. This Houston park has Kinder Lake for kayaking and remote sail boating racing, along with a band stand for weekly music event and a children’s play area including a splash wet area, also there are many restaurants in and near the park. Special events are held here year round they even have ice skating in the winter time in the park. The Houston Discovery Green park is also near many hotels and is also walking distance to the Toyota Center and Minute Maid park. We prefer to stay in this area because there is so many restaurants and thing to do nearby. The Discovery Green park was funded by private and public money. 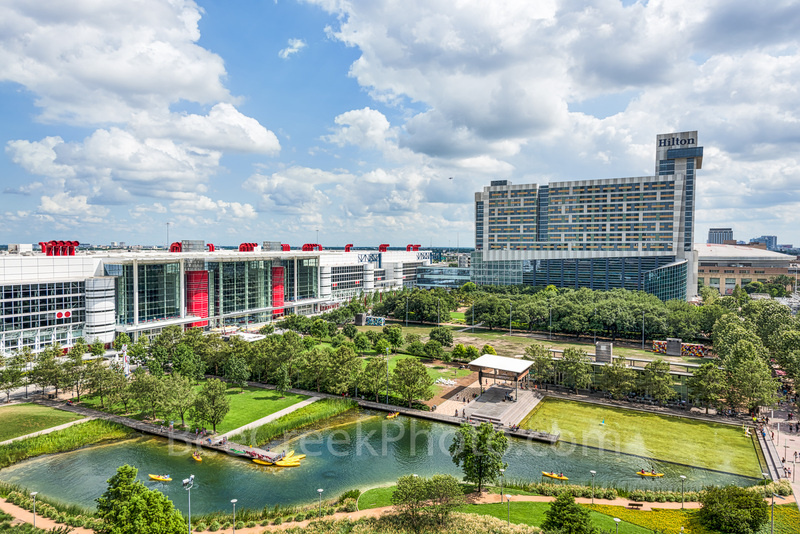 Posted in Photo of the Day and tagged city park, Discovery Green Park, downtown, hotels, Houston city park, Houston cityscape, ice skating, kayaking, kayaks, Kinder Lake, minute maid park, restaurants, toyota center on August 4, 2017 September 26, 2018 by Bee Creek Photo. 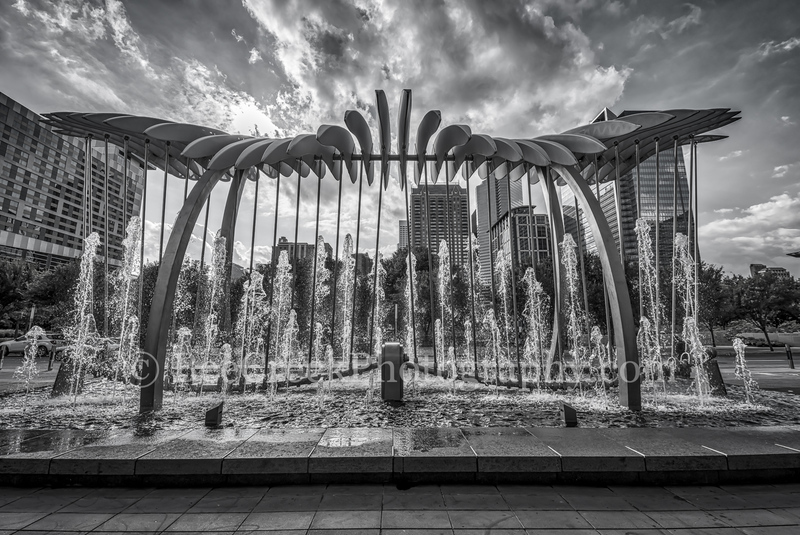 Houston Cityscape Wings Over Water BW – This is a new sculpture in Houston on the Avenida plaza in front of the George Brown Convention Center in downtown across from the Discocery Green park done in black and white. This wonderful sculpture with water fountain which is 60 feet wide by 30 feet tall has this kinetic wing which move as though they are in motion and it is meant to represent migration as those who migrate to Houston seeking a better life. The wings of the sculpture mesmerizing movement of the undulating surfaces creates a new focus for those who visit and a new iconic destination. From this angle you can see the Discovery Green park and the cities high rise buildings in the area. 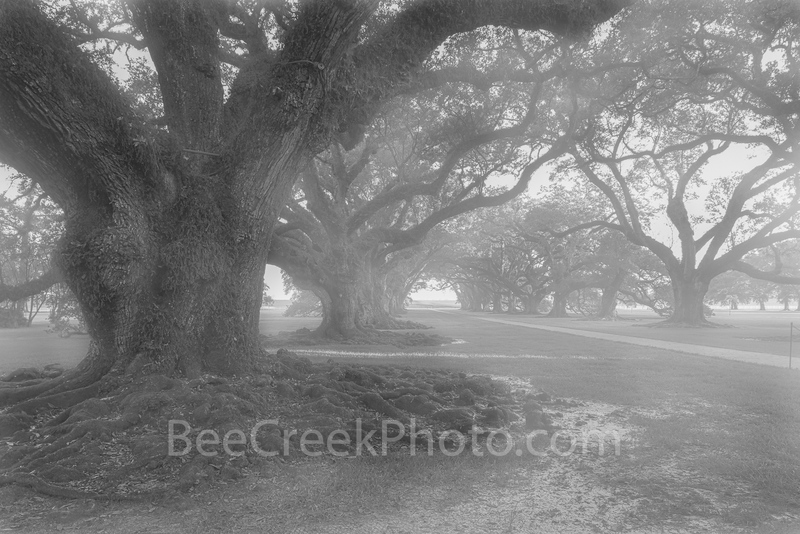 Posted in Photo of the Day and tagged art, best of houston, black and white, blackandwhitephotography, bw, bwphotography, city, cityscape, downtown, George Brown Convention Center, Houston, Houston art, lifestyles, monochrome, scuplture, street scenes, streetart, streetphotography, streetphotos, urban, urbanphotography, water fountain, Wings Over Water on August 3, 2017 September 26, 2018 by Bee Creek Photo.